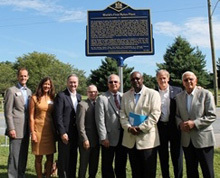 TO MARK the 75th anniversary of the world’s first nylon plant, the State of Delaware Public Archives commissioned a marker that was unveiled at the plant site in Seaford. Work on the plant was started by DuPont de Nemours in March 1939 and the facility started up only nine months later in December of the same year. Dupont sold the plant to Koch Industries in 2004 after having changed the name of its fibre division to Invista. In 1939, a major end-use for nylon yarn was for parachutes and other military supplies, followed soon after by hosiery, then by a wide range of applications including swimwear and intimate apparel. It was only when nylon became available that a totally suitable alternative to wool was found for the production of swimwear.